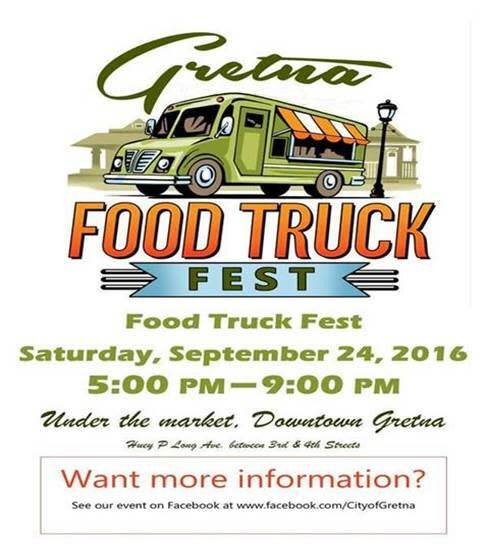 The City of Gretna is excited to host its 4th Food Truck Festival this Saturday, September 24, 2016 between the hours of 5pm and 9pm. The trucks will be located at 739 Third Street. Participating vendors will include 12 food trucks with a variety of foods, and several non-profit groups selling snacks and refreshments. Festival-goers will also be able to enjoy the LSU vs Auburn game on a 20 foot, outdoor screen. For a list of participating vendors please visit http://www.gretnala.com/egov/apps/document/center.egov?view=item;id=2521.